Bernie fans are passionate, courteous, knowledgeable and smart. They are also open minded and surprisingly, although many were young, represented by all ages. I talked with Nelson about mass incarceration: "You know, I'm just 35. I am here to talk with people and learn some things new." I talked with a silver haired grandmother about Israel's relationship with Palestine and the J Street NGO . This same grandmother was extraordinarily knowledgeable about the TPP. My accomplice met a fellow Bellinghammer about her age and spent some time talking with her. A young veteran for Sanders talked with us about foreign policy and how it affects the fate of millenials. A young couple distributing Socialist Alernative literature talked with me about the divisions in Trotskyism, various socialist interpretations of Bernie Sanders, and developing a stronger Marxist curriculum in American colleges. A ex farm worker from Pasco talked with us about racism in eastern Washington. In truth, I just don't get enough adult conversation in my life as a blogger/"Stay at Home Dad". I live inside my head far too much because the ignorance of the world scares me. But just for today, I thought I might have died and gone to heaven. "Does anyone even know a Hillary supporter? ", I heard more than a few people say. "I know one," someone said. The time passed quickly but the security checks took a long time and it was announced they needed to take away the outside food that I had brought in my four year old son's "Friendly Dinosaur" lunch bag. I was feeling a little tired and shaky from the week, so I told my friend to go on without me. I needed some coffee and food at The Armory. A French festival was playing on center stage. An excellent French jazz singer and a whole milk latte helped me recover. 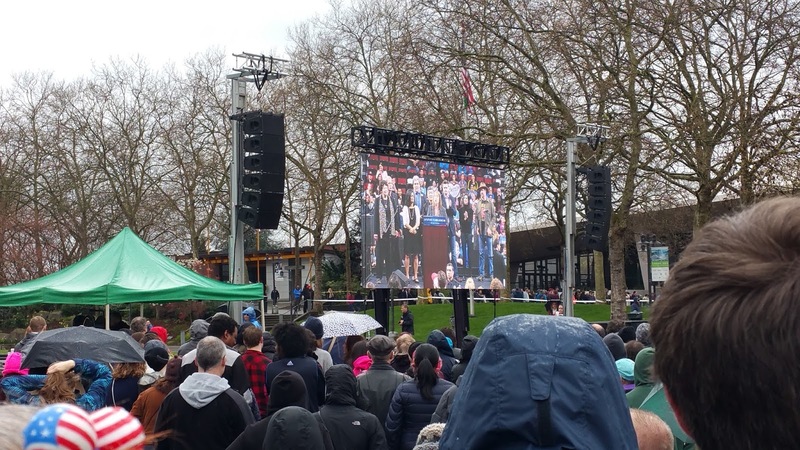 When I went back outside, the big screen had been set up to broadcast all the Bernie warm up speakers inside the Key Arena. Two of them I saw just killed it on stage. One was Pramila Jayapal (current WA 37th LD rep and candidate for 7th Congressional) and one was Noel Frame, legislator of the WA 36th District. Noel Frame rocked! "Eight years ago I was here listening to Barack Obama. He inspired me to run for local office. I want Bernie to do the same for all of you!" Noel Frame rocks the Bernie Crowd! Then something extraordinary happened. 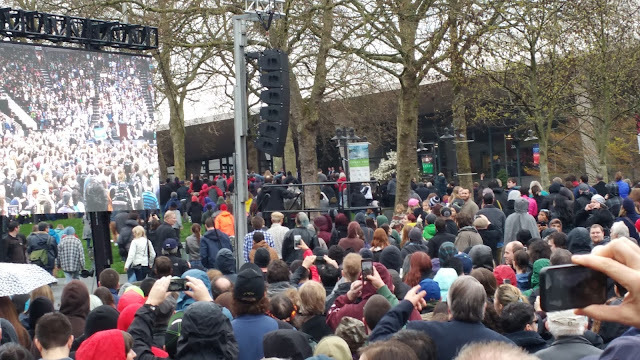 While we were all outside watching the screen for signs of Bernie, the man himself just showed up, set up a podium under the eaves of the Key Arena, and gave us his stump speech for 20 minutes before going inside to the seated crowd. He talked about how he differs from Hillary Clinton, environment, energy, jobs, health insurance, medicare, free college for all, renegotiating existing college debt, minimum wage, police militarization, black lives, gay and lesbian rights and a woman's right to choose. It was incredible: the crowd converged and Bernie fired us up by talking to us about how change can happen! The man himself suddenly arrives and speaks first with us outsiders! A light rain began to fall. I went back to The Armory and had curry meat pie with dark gravy. I watched the last remaining French festival act and prepared to go home. What a great day! I actually felt hope! It's been a long time since I have felt any hope. If Bernie doesn't win (and I believe he will), I am going to personally tear open a portal in the space-time continuum and invite all the other Bernie Believers to travel with me to a new, beautiful, just and fair world. The rest of you can just stay down here on whatever remains of an Earth ruled by either Hillary Clinton or Donald Trump! To hell with all of that. Awesome post. What a very human experience. Thank you for sharing.